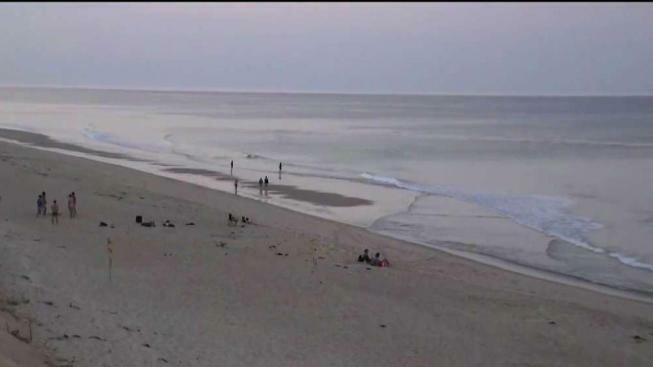 A shark attacked a man off the coast of Long Nook Beach in Truro, Massachusetts. A man suffered "deep puncture wounds" when he was bitten by a shark while standing in the water just 30 yards off shore of a Cape Cod beach on Wednesday afternoon. The victim was bitten near Long Nook Beach in Truro, according to police. The Truro harbormaster said the victim, a 61-year-old man, suffered puncture wounds to his torso and leg. He was transported to Wellfleet and then taken by medical helicopter to Tufts Medical Center in Boston. His condition was not immediately known. The incident was reported at 4:15 p.m., 300 yards south of Long Nook Beach. It is not known yet what type of shark bit the man. According to Cape Cod National Seashore officials, the victim said he was standing in the water 30 yards off shore when the shark bit him. Long Nook Beach has been closed to swimming until further notice, according to the town's website, but some swimmers can still be seen in the water. No further details on the attack were immediately available. U.S. National Park Service rangers are investigating. There have been a number of close encounters in recent weeks, with sharks leaping out of the water after fishing lines and one even jumping at a shark scientist who was on a research boat. There have been 10 great white shark sightings in the past week, and more than 60 over the last month off Cape Cod, according to the Sharktivity app. It's been six years since a shark has attacked a person off the Massachusetts coast. Last August, a shark bit into a stand-up paddleboard in 3-foot-deep water off Marconi Beach in Wellfleet. "I caught a few waves and was paddling back out and I was moving to stand up when I got knocked off my board," 69-year-old Cleveland "Cleve" Bigelow said at the time. "It felt like getting hit by a truck while on a bicycle. It was a shock. I thought, 'What was that?'" He was not bitten and was able to paddle to shore. In September 2014, two kayakers were knocked out of their boats by a great white shark off Manomet Point in Plymouth. Two years before that, in 2012, a 50-year-old man was bodysurfing with his son off Ballston Beach in Truro when he was bitten by an eight to nine foot shark. He suffered nerve and tendon damage, but otherwise fully recovered. Prior to that, the last shark attack on a human off Cape Cod was in July of 1996, when a 46-year-old man was bitten while collecting starfish in North Truro.